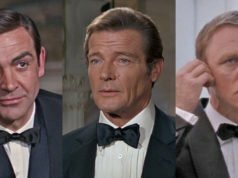 Whereas Sean Connery and George Lazenby wear solid grenadine and knitted ties in their James Bond films, Roger Moore often wears solid ties in other weaves. 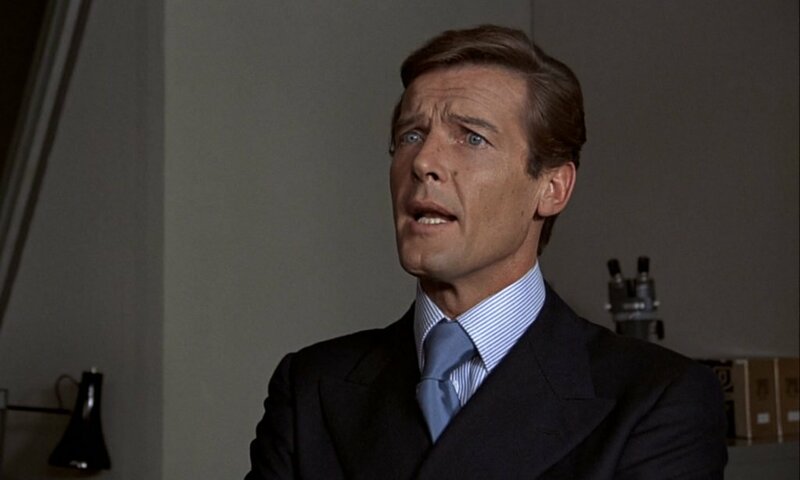 In The Man with the Golden Gun (below), Roger Moore wears a red tie with a pebbled effect with his grey chalk stripe suit, that may be created by floated yarns to give the tie texture. Turnbull & Asser’s “Lace” ties are a great example of a textured pattern. The satin silk tie is the shiniest tie and is most appropriately worn in the evening or for more formal occasions. The satin weave has an even shine due to a high number of floats. The light blue satin tie that Moore wears with his navy double-breasted blazer below is also from The Man with the Golden Gun. The last tie of this entry is the shantung silk tie. Shantung silk is woven in a plain weave and has a ribbed and slubby yet very shiny surface. It’s very unique and can be worn for a variety of occasions, from sporty to formal. The blue shantung silk tie that Moore wears with his single-breasted blazer below is from The Spy Who Loved Me. Roger Moore ties his ties with a four-in-hand or double four-in-hand knot, characterised by its asymmetrical shape. The makers of Bonds shirts (Turnbull and Asser or Frank Foster) is discussed elsewhere in the blog. Connery's grenadine ties came from Turnbull and Asser, and you can still get the same ties there (though in a slightly wider width). His knit ties probably came from there too. There are many brands that make identical grenadine and knit ties. 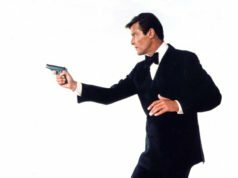 I have no idea where Roger Moore's ties came from, but the solid ties mentioned in this article could have come from almost anywhere in London. An interesting thing about James Bond that many people may not know is his dislike of the Windsor Tie Knot. Bond considered a man who sported a Windsor Tie Knot a cad and a man not to trust. Ian Fleming created this trait in his debonair spy probably as a way to reflect what many British subject has as a common opinion about the Windsor. The Duke of Windsor had an affair with married American women, Bessie Wallis Warfield Simpson who became divorced over the scandal. He had taken the throne in 1939 however abdicated as he chose to marry the woman he claimed to love although his marriage to the divorced woman was against the church. His royal subjects were heartbroken, this was their prince and she was the cause of his decision to not continue as King. A cad for cheating with another man’s wife, maybe. The Duke of Windsor had taken an emotional toll on the United Kingdom and apparently Ian Fleming was not to forget it. 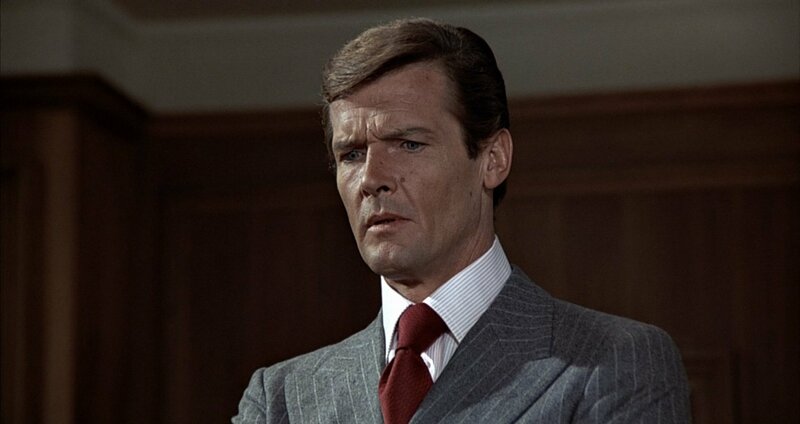 Roger Moore's ties are not tied with a Windsor knot. The shape is that of a four-in-hand or a double four-in-hand (aka Prince Albert). The Duke of Windsor typically did not use a Windsor knot but rather a four-in-hand. The shape of a Windsor knot is considerably different. King Edward VII is the man who used the Windsor knot. "Double Windsor" is an incorrect name for what should properly be called a "Full Windsor." 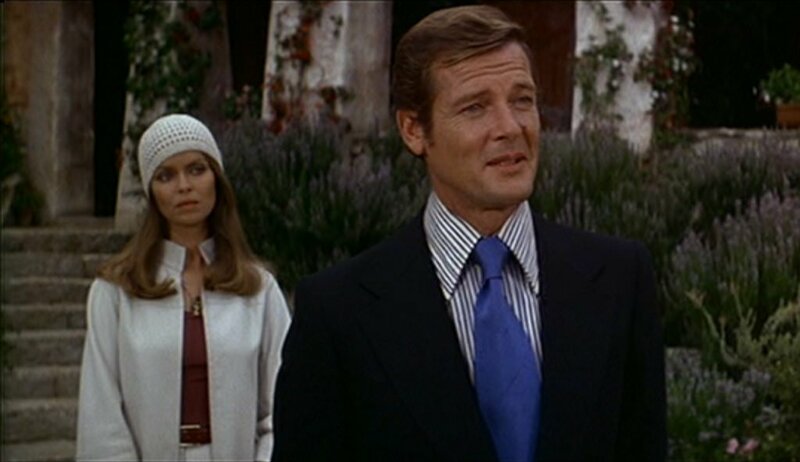 Bond has used a Windsor knot in Dr. No, On Her Majesty's Secret Service, and Diamonds Are Forever. I know it has no connexion with Bond Matt, but I have a question about satin silk ties. In North by Northwest, do you know if Cary Grant wears a grey satin silk tie with his famous grey glen plaid suit ? Or is it just a simple silk tie ? That outfit isn’t actually that far removed from Bond and I plan to write an article on it soon. I’ll answer your question there. Just joking. Thanks for the great articles. How is a “laced” tie different from a grenadine? I guess the Grenadine is a type of laced tie. What are other laced types? The Turnbull & Asser’s “Lace” (not “laced”) tie I mentioned is woven with floats that mimc the appearance of lace. Fake grenadine ties and other textured patterns are usually woven with the same principle. Grenadine is unrelated, as it is woven in a gauze weave (also called a leno weave). Gauze weaves have twisted yarns.